Check out Tobi's Harlequin Romance Sequin Bodycon Dress Glam up for the holidays with the Harlequin Romance White Sequin Bodycon Dress. 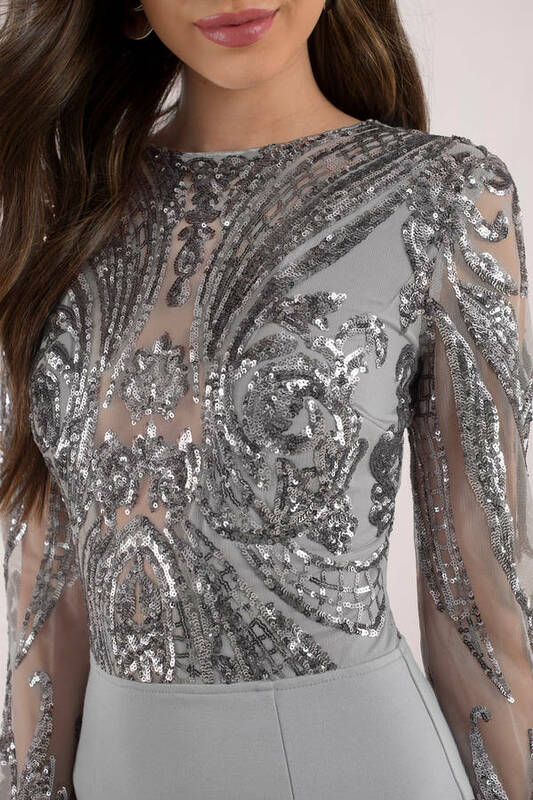 This long sleeve sequin dress features a baroque sequin bodice, high neckline, fitted construction, and side slit. Pair this sequin sheath dress with platform heels for the ultimate glamorous look. Glam up for the holidays with the Harlequin Romance Grey Sequin Bodycon Dress. This long sleeve sequin dress features a baroque sequin bodice, high neckline, fitted construction, and side slit. Pair this sequin sheath dress with platform heels for the ultimate glamorous look. Glam up for the holidays with the Harlequin Romance White Sequin Bodycon Dress. This long sleeve sequin dress features a baroque sequin bodice, high neckline, fitted construction, and side slit. Pair this sequin sheath dress with platform heels for the ultimate glamorous look. Grey modeled on a size X-Small.